Here is my best albums list for 2011. These are not necessarily the “top” albums of the year, since it’s impossible for me to hear and evaluate every new release that comes out. Rather, these are the records that I found myself coming back to over and over again, and I expect to keep coming back to them in the future. I love big, messy, imperfect records, and “w h o k i l l” is all that and a bag of chips. Merrill Garbus gets my vote for indie genius of the year with her hypnotic looping and bare honesty. I can headbang to “Strange Confessor” while blasting it in the car just as easily as I can study to it on headphones in my office. It’s visceral, but it’s also complex. It makes me love rock again. I appreciate Annie Clark more and more with each record she makes. “Strange Mercy” plays like literary short fiction set to a shredding series of guitar freakouts. The stories feel urgent to me. Every time I listen to “Arabia Mountain,” I imagine a bunch of alley cats roaming the cluttered streets of a sunshiney college town looking for scraps. This is a karaoke party waiting to happen. This band is my favorite new discovery this year, out of Costa Mesa. “Eternally Teenage” is a shambling mishmash of lo-fi psychedelic pop. It sounds like a box of lost Lou Reed surfer tapes. Black Joe Lewis beats the Black Keys for best garage rock record this year, hands down. The head-bobbing thump and squawk of “Scandalous” sounds bluesy, funky, and downright dirty. I’m pretty discerning with my noise pop, but “Medicine” can hold its own alongside any record out right now on Matador, Slumberland, or In The Red. And, it actually sounds better on cassette tape! It always surprises me to hear new music that sounds effortlessly old. Charles Bradley reminds me of Otis Redding on “No Time for Dreaming,” and that kind of soul never goes out of style. While critics fawned over the iPad apps, I couldn’t help but focus on “Biophilia” as a key evolutionary document for one of my favorite artists. It felt like my new go-to Bjork record, and I hadn’t thought that in years. The stripped-down ache and hum of “Helicopter Circles” puts a melancholic sheen on Niilo Smeds’ lo-fi EP from earlier this year. He is the best songwriter in Fresno right now – period. Shannon & The Clams / Sleep Talk / 1-2-3-4 Go! 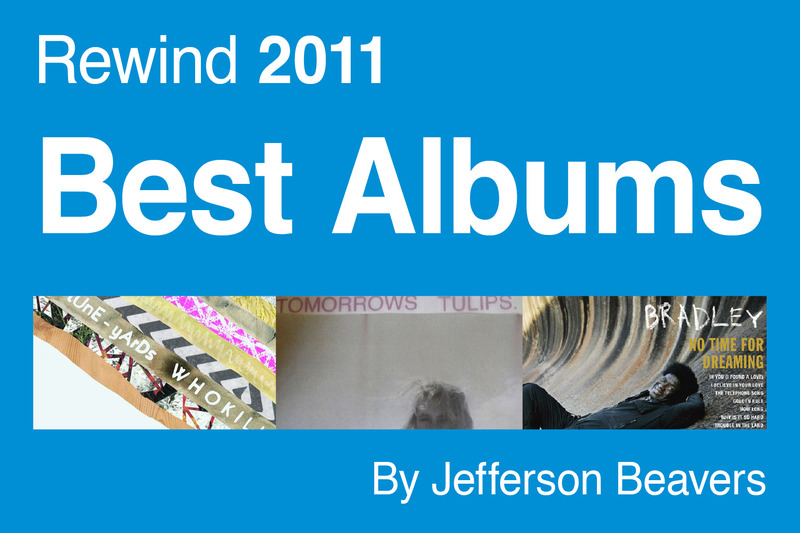 Please share your top albums of 2011 lists in the comments. Thank you, Teresa! Yes, definitely, tUnE-yArDs are for reals! Check out their 4AD Session to appreciate Merrill Garbus in a little different light.